Rabat - Palestine reiterated its support for Morocco’s sovereignty over Western Sahara on Thursday at a diplomatic meeting between both countries, held in Rabat. Rabat – Palestine reiterated its support for Morocco’s sovereignty over Western Sahara on Thursday at a diplomatic meeting between both countries, held in Rabat. In a working visit to Morocco, a Palestinian delegation met with the leader of opposition party l’Union Socialiste des Forces Populaires, known as USFP, according to Arabic daily Al Ittihad Al Ichtiraki in its Friday issue. USFP leader Driss Lachgar discussed the Moroccan Sahara with Abbas Zaki, member of the Fatah Central Committee. 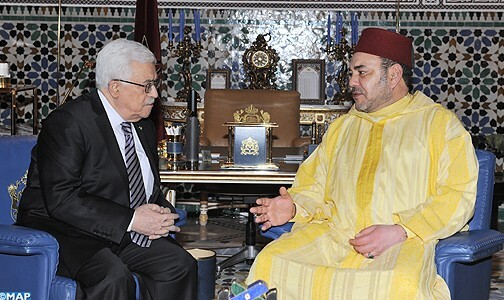 The meeting was held in presence of the Ambassador of Palestine to Morocco, Amine Ahmed Mohamed Abou Hassira, as well as three other Fatah leaders alongside Abba Zaki. The working visit of the Palestinian delegation comes just weeks after Palestinian Foreign Minister Ryad El Maliki visited Morocco and declared Palestine’s support for Morocco’s territorial integrity. “There is no need to make any comparison between the Palestinian cause and the Moroccan Sahara issue,” El Maliki stressed. “We struggle against the Israeli occupation since 1948 and Morocco struggles for the achievement of its territorial integrity,” he added. The Palestinian position with regards to the Sahara comes as a rebuttal to the attempts made by Algeria and the Polisario in recent years to equate the question of Palestine with the dispute over Western Sahara. The parallel that Algeria and the Polisario sought to establish between the two questions gained traction after Sweden recognized the Palestinian state in October 2014. The Swedish recognition of the Palestinian state gave the Polisario hope that Stockholm would recognize the self-proclaimed Saharawi Arab Democratic Republic (SADR). However, the Swedish government made it clear last October that there is no parallel between the recognition of Palestine and Western Sahara. “As both the Swedish Prime Minister and the Minister for Foreign Affairs have both previously stated, there are no parallels between the recognition of Palestine and Western Sahara,” the Swedish Ministry of Foreign Affairs told Morocco World News last October.